This entry was posted in Conservatives, Unions. Bookmark the permalink. At the time, and for that matter for centuries up until really recently, consuming more was a signal that you’d made it that much closer to where you, and everybody, wanted to be. Without want. After you get there you discover the problems associated with it. It’s somewhat like our love of fats, which was a helpful drive for most of our existence when getting enough fat was difficult. Once we got to the promised land of plenty, okay, now we see the attendant problems. That’s that one point of course. 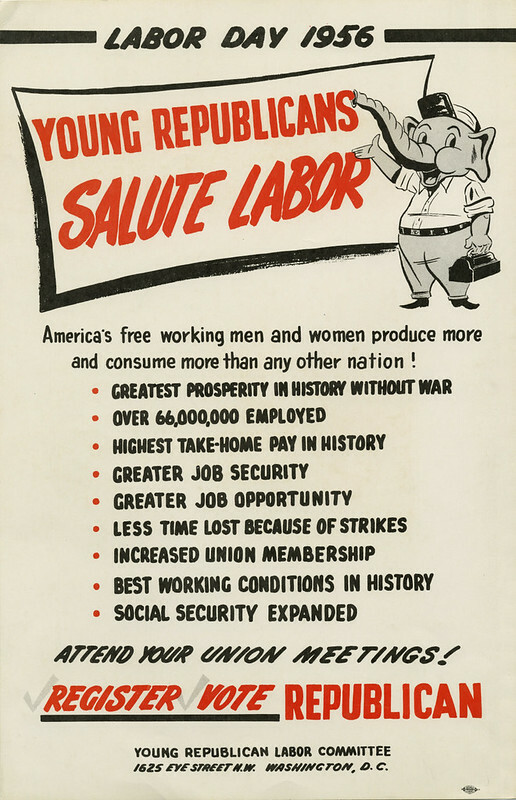 The more interesting points on that list are the ones that no modern Republican would brag about – like increased union membership and expanded social security. So much so I’ll bet you could start an urban legend that the kids nowadays think that pamphlet is a modern hoax. In the post-war Eisenhower era paying more taxes was a status symbol, in a faux “patriotic” sort of way. Actually making “America” GREAT! Making all that happen. And it was generally agreed that NAZIs were a bad thing.